Denise is an accredited specialist in family law and is qualified as a solicitor in Scotland, England and Wales. She is praised by clients for being “very easy to work with” and for her ability to “put things in a way that normal people can understand.” She is recognised as a leader in her field and is considered ‘one to watch’ by the latest Chambers and Partners’ guide to the legal profession. Denise is also a practising collaborative family lawyer and an accredited family law mediator, assisting couples in resolving all aspects of the breakdown of their marriage or relationship in a non-adversarial way. She has over 24 years of experience of acting for married parties and cohabitees in all aspects of divorce and separation including financial settlements, child disputes, child welfare issues and pre-nuptial agreements, both within Scotland and involving cross-border disputes. She has significant expertise in high-value separations and has worked on cases with considerable international and corporate concerns. 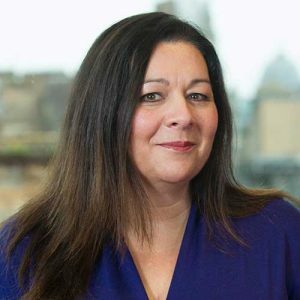 She is the author and presenter of the Law Society of Scotland’s Family Law Certificate Advanced Module “An Introduction to Jurisdictional issues in Family Law (including issues relating to forum shopping)”. Denise has a specialism in dealing with armed forces divorce and pensions.